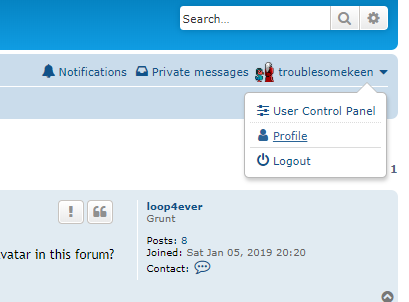 Public Commander Keen Forum • Avatar Help! So I've been trying to get an avatar for my self but I just can't seem to figure out how? can some one show me how you get an avatar in this forum? I think the best way to do it is by uploading a picture to a image-sharing site, something free like imgur, then paste the link to that image to your profile. Then select "Edit avatar" and you'll see a space where you can post the link in the "Link off-site" space. Be sure to check the dimensions. would it be possible to host any and all user avatar images on the keenmodding.org server? I mean this shouldn't take too much storage space, right? And the advantage would be, that we gain independens of external hosting services which might shut down their services unheralded.